Lake Gaston has 350 miles of beautiful shoreline with ecological guidelines in place to protect its inhabitants. 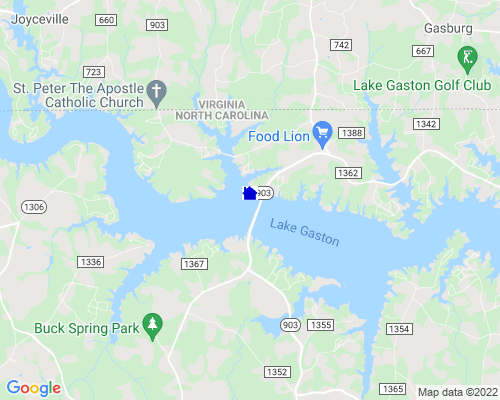 Lake Gaston is 34 miles in length and 1.3 miles across at its widest point. The meandering Roanoke River unwinds for a bit in the 30,000+ acres of surface waters and caresses the shoreline in three counties of North Carolina and two of Virginia. Magnificent tall pines, sturdy hardwoods, natural dogwoods and hollies experience all four seasons and create a tranquil country setting just minutes away from shopping, medical facilities and entertainment. The sparkling green waters provide an abundance of treasures that are enjoyed by lake enthusiasts -- fishing, boating, swimming, water skiing, jet skiing and just relaxing. Public golf courses, walking trails, fitness centers, cultural art centers, local historical sites and antique shops are a few of Lake Gaston's points of interest. Water Level: Average water level variance? 18 in. Depth of Lake: 204 ft.